Applesauce is a sauce made by cooking apples until they go break down into a purée. Sometimes, flavouring (such as cloves or cinnamon) and a sweetener might be added. In commercial operations, machines wash, peel, core and seed the apples, leaving just the flesh, which is chopped up by other machines and steam cooked, then stirred to make it smooth (unless the sauce is being sold as “Chunky”) then bottled or canned. At home, you can make sauce out of any apples you want. Depending on the variety you use, softer apples will make a more liquid sauce, while firmer ones may need a longer cooking time to coax them into going breaking down completely. Tart ones may, depending on the taste of the cook, call out for a sweetener, while naturally-sweet apples may be fine on their own. Home cooks often use two or three different types of apples, to make a sauce that has a more complex taste to it than commercial applesauce — and why not, if you’re going to the trouble to start with. Chunk the apples, then core and seed them, but leave the peels on to start — it provides a bit more pectin to give the sauce more body. Place apples in a covered pan, and start them at a very low heat — you will crank the heat up in a while, but first you want to coax some juice out so that when you do crank the heat up, you won’t just fry the apples. If you think that nothing is happening on the juice front and are getting a bit antsy and want to crank that heat now, add some water or apple juice. When there is a good covering of liquid in the pan — either because you released it from the apples or dumped it in — you can turn the heat up somewhat, and let the juice and apple mixture start to bubble and actually cook. Stir them around a few times to encourage them to break down, just like you did with your ex. If you used soft apples, you should have sauce within 10 minutes; it will take about 5 minutes longer for firmer apples. Remove from heat, let cool a bit, and press through a strainer to remove the skins. Taste to see whether it needs any sweetener – usually, it should be fine as it is. If it does need sweetening, try white sugar, honey or maple syrup. You can even try brown sugar, if you don’t mind the colour being affected. 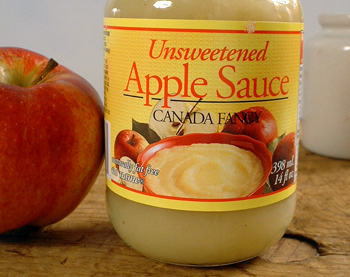 Applesauce is often used as a substitute for fat in recipes. Like fat, fruit purées have the ability to help to make dough softer (they do this by weakening the structure of gluten in flour). The body of fruit purées can also provide some of the “mouth feel” that fats do. Since Applesauce doesn’t have the true ability of fat to weaken or coat gluten, when using Applesauce it’s especially important to not overwork your dough, thus avoiding gluten development (unless you’re making bread, of course). When substituting Applesauce for the fat in a recipe for the first time, try substituting for no more than half the fat and see how you get on. If there’s no discernible negative impact, you can increase the proportion of Applesauce the next time. Freeze in sealed plastic container or freezer bag for up to 1 year. “APPLE SAUCE: Pare, core, and slice some apples; boil them in water with a bit of lemon-peel; when tender, mash them; add to them a bit of butter the size of a walnut, and some brown sugar. Heat, and serve in a sauce-tureen.”  Mrs Dalgairns (aka Catherine Emily Callbeck Dalgairns). The Practice of Cookery Adapted to the Business of Every-day Life. (8th edition). Edinburgh: Robert Cadell. 1840. “New quick-frozen, ready-to-eat foods come in never-ending procession. Quick-frozen applesauce is new on the Birds Eye list. Thaw and heat to use over gingerbread in place of whipped cream. Leave it partially frozen, but soft enough to spoon up and serve as a sherbet-like relish with pork. Serve it as a breakfast fruit, either by itself or to tip-top a hot cereal. Spread it over crisp waffles or French toast or a pancake. Flavor with mint and tint a pale green to serve with the lamb.”  Paddleford, Clementine (1898 – 1967). Food Flashes Column. Gourmet Magazine. June 1944. “Akin to this is the notion that a ‘bad woman can’t make good applesauce’ — it will always be mushy, and not sufficiently tart. This is so generally accepted in some sections as to have passed into the language, and the mere statement that a certain woman’s applesauce is no good is generally understood as a slighting reference to her morals.”  Randolph, Vance. Ozark Superstitions. Columbia University Press, 1947. Chapter 4. 2. ↑ Mrs Dalgairns (aka Catherine Emily Callbeck Dalgairns). The Practice of Cookery Adapted to the Business of Every-day Life. (8th edition). Edinburgh: Robert Cadell. 1840. 3. ↑ Paddleford, Clementine (1898 – 1967). Food Flashes Column. Gourmet Magazine. June 1944. 4. ↑ Randolph, Vance. Ozark Superstitions. Columbia University Press, 1947. Chapter 4.